Dapper O'Neil, whose charming presence and lacerating tongue kept alive for decades a bygone era of Boston politics, died yesterday. Often the top vote-getter in City Council races, Mr. O'Neil became one of the more revered politicians in the city's history with his attentiveness to the smallest needs of constituents, even as his caustic statements about minorities, women, gays, and lesbians made him one of the most reviled. Modeling himself on legendary Mayor James Michael Curley, Albert L. O'Neil was one of the few remaining links to a time when Irish Catholic men dominated Boston's political landscape. Mr. O'Neil died in his sleep in a West Roxbury nursing home. He was 87. At 13, Mr. O'Neil got his first taste of politics while Curley was still mayor. Handing out leaflets in his Roxbury neighborhood for a City Council candidate was the bottom rung of a political ladder that reached the council presidency before he lost a bid for a 15th two-year term. "The great irony of Dapper was his kindness and generosity to so many people," said Councilor Stephen J. Murphy, a longtime friend of Mr. O'Neil's. "At the same time, he fearlessly and deliberately violated the rules of political correctness. He'd say, 'Watch me get them going.' "
Said Mayor Thomas M. Menino: "It's the end of an era in Boston politics with the passing of Dapper O'Neil. He was the greatest storyteller there ever was. The real question is whether all those stories are true." Not in question were Mr. O'Neil's many public pronouncements, duly recorded in newspapers and on radio and television during his 28 years on the City Council. More complex than the sum of his words, Mr. O'Neil was raised in an Irish Catholic family of limited means and was fiercely protective of what he called the little people of Boston. In a failed 1967 bid for mayor, he told the Globe he was tired of watching "the good people driven from the city because of high costs and beer-swilling students, who live on booze and drugs." "They've ruined the Back Bay," he said, "and now they're ruining Beacon Hill." Mr. O'Neil had harsher words for minority communities, and often showed little respect for women, particularly those in positions of authority. In 1992, a television camera crew captured Mr. O'Neil talking with a police superintendent after riding past Vietnamese businesses along Dorchester Avenue during a parade. "I just passed up there," he said. "I thought I was in Saigon. . . . It makes you sick." In 1977, when Lisa Zankman appeared before a budget hearing while representing a community-schools program, Mr. O'Neil told her at one point: "Get mad, Lisa. I like to see a woman get mad." An outspoken opponent of affirmative action, he was also disdainful of gays and lesbians. When a judge ruled that a gay pride group could march in South Boston's St. Patrick's Day parade in 1993, Mr. O'Neil said: "For the first time in many years, I will not be part of the parade, because I will not have my nose rubbed into their way of living." Criticism was swift and often as sharp as his disparaging comments, but Mr. O'Neil largely shrugged off the opinions of those who didn't like his style. "Dapper was certainly the old school, but sometimes the old school was the best school," said Raymond L. Flynn, who was mayor for part of the time Mr. O'Neil was a councilor. "He was not politically correct and didn't try to be, and he could get people upset with him. He did that frequently." Nevertheless, Mr. O'Neil endeared himself to many voters through attentiveness to constituents and mastery of old-fashioned politicking. "He'd go to four or five wakes a night," Flynn said. "When he'd come back from the wakes, I'd see him the next morning with little pieces of paper in his pocket. We'd go to breakfast at Amrhein's, and he'd pull out a little note with a name and phone number on it, and you could hardly read it." Mr. O'Neil would often walk into Flynn's mayoral office without an appointment. "He was looking for a turkey or a ham for a poor family who had been burned out by a fire or to help some veteran friend of his who got laid off from work," Flynn said. "I would do what he asked me to do. It was heartfelt, and it was refreshing, actually, because that's the school I grew up in, as well. That's what politics is supposed to be about, helping people. He learned it from Curley, and I learned it from them." The youngest of four children in a single-parent household, Mr. O'Neil was raised by his mother in Roxbury. As one story has it, he was tagged with the nickname Dapper as a child for sporting a Dutch boy haircut and wearing Buster Brown collars. He graduated from Roxbury Memorial High School and went to Suffolk University, leaving after a year to serve in the US Army in Europe during World War II. Afterward he graduated with a degree in oratory from Staley College of the Spoken Word in Brookline, which closed more than 45 years ago. After the war, he worked with a railroad company and then got a job with the state housing board. From 1948-1961, Mr. O'Neil failed in his first five attempts at elective office, three times for state representative and one apiece for City Council and School Committee. 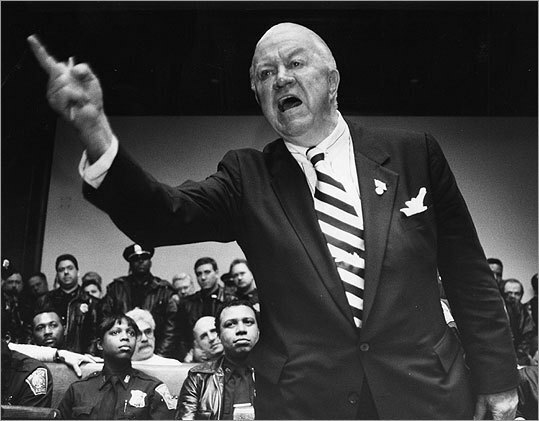 Governor Endicott Peabody, for whom he had been a driver, appointed Mr. O'Neil to the Boston Licensing Board in 1963, and he immediately launched a "no booze for kids" campaign, going after bars that served underage college students. He became chairman of that board a year later and ran unsuccessfully for mayor in 1967. Another mayoral bid fell short in the 1970s, as did two campaigns for sheriff. A registered Democrat, he was staunchly conservative and first joined the council in 1971. He had finished out of the running in the election, but was appointed to fill the seat vacated by Louise Day Hicks after she was elected to the US House of Representatives. Picking up where Hicks left off, Mr. O'Neil opposed busing in school desegregation efforts. Running as an at-large councilor, he was reelected again and again and in 1992 filled the remaining few months of the council president's term after Councilor Christopher Iannella died. "It's a great honor you've bestowed on me," Mr. O'Neil told his colleagues when elected to the post. In his 70s, Mr. O'Neil, a longtime resident of Roslindale, faced a series of health problems, including prostate cancer and knee surgery. He campaigned using a walker or wheelchair when necessary and served until 1999, when he lost to Michael F. Flaherty. "Dapper outlived a style of politics which has gradually died out," Thomas H. O'Connor, university historian at Boston College, told the Globe after Mr. O'Neil's defeat. "This is the last hurrah not merely for a man but for the politicking he represents." Still, Suffolk District Attorney Daniel F. Conley said in a statement yesterday, "Dapper was a true Boston legend. "It was an honor to serve as his city councilor when he held an at-large seat and I represented District 5, and though we clashed on some issues, we were strong allies on others," Conley said. "He could put on an irascible public persona, but behind the scenes he was a gentleman." Mr. O'Neil never married, but for years dated Helen Skrzowski. A funeral Mass will be said at 10 a.m. Monday in St. Theresa of Avila Church in West Roxbury. John R. Ellement and Donovan Slack of the Globe staff and Globe correspondent Tom Long contributed to this obituary.